Oxford United are ready to bide their time in the search for a new manager, with David Unsworth out of the running. Everton Under-23 coach Unsworth is one of a number of people spoken to about the vacancy, following Pep Clotet's sacking. But 44-year-old Unsworth has told BBC Radio Oxford he will not be taking the job at the Kassam Stadium. Derek Fazackerley remains in caretaker charge of the team and owner Daryl Eales has said there is "no rush". 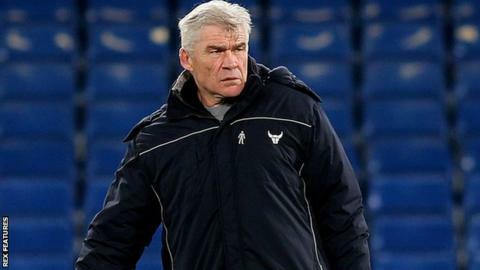 The League One club have been without a manager since Clotet was dismissed on 22 January after a home defeat by Bury. Former defender Unsworth, who had an eight-game spell in charge of the first team at Everton earlier this season following the dismissal of Ronald Koeman, was reported at the weekend to be in the running for the Oxford job. But it is understood he had not been identified as first choice and the role has not yet been offered to anyone. Speaking following Saturday's win over Charlton, caretaker boss Fazackerley told BBC Radio Oxford: "I'll just carry on. The club over a period of time will obviously make a decision on what they want to do, and whatever they decide to do, I'll be quite comfortable with it."